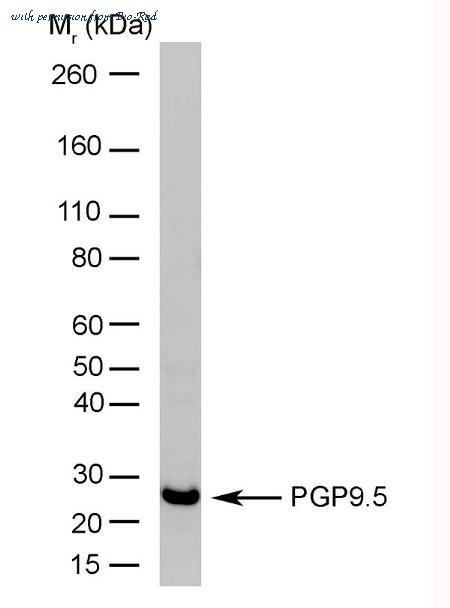 The UCHL1/PGP9.5 antibody from Proteintech is a rabbit polyclonal antibody to a recombinant protein of human UCHL1/PGP9.5. This antibody recognizes human,mouse,rat antigen. 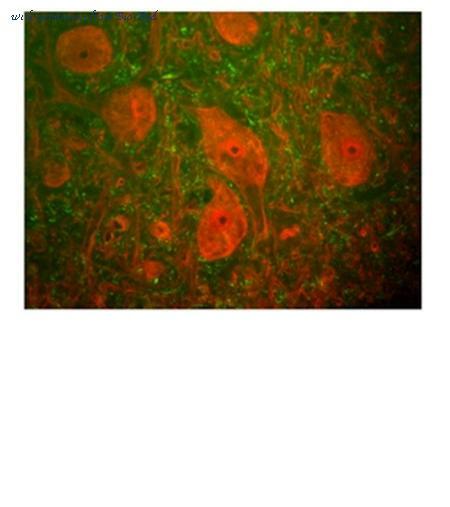 The UCHL1/PGP9.5 antibody has been validated for the following applications: ELISA, IF, IHC, IP, WB analysis. 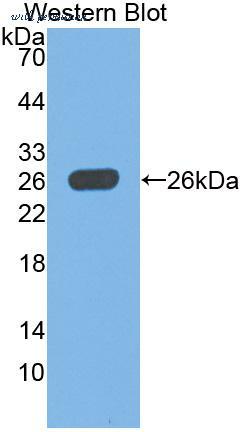 The UCHL1 antibody from Proteintech is a mouse monoclonal antibody to a recombinant protein of human UCHL1. This antibody recognizes human, mouse, pig, rat antigen. 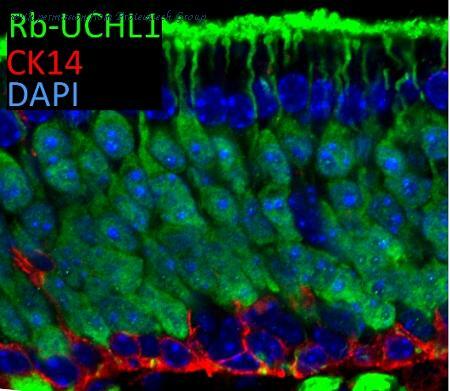 The UCHL1 antibody has been validated for the following applications: ELISA, IHC, IF, WB analysis. Immunocytochemistry/Immunofluorescence: PGP9.5 / UCHL-1 Antibody (31A3) [NB600-1160] - analysis of PGP9.5 in rat mesenteric artery using anti-PGP9.5 antibody. Image from verified customer review. Simple Western: PGP9.5 / UCHL-1 Antibody (31A3) [NB600-1160] - Electropherogram images of the corresponding Simple Western lane. 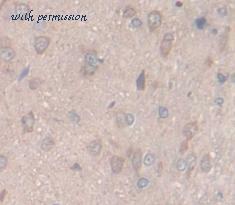 PGP9.5 / UCHL-1 antibody was used at 10 ug/ml dilution of h. Cerebellum and IMR-32 lysates(s) respectively. Simple Western: PGP9.5 / UCHL-1 Antibody (31A3) [NB600-1160] - Simple Western lane view shows a specific band for PGP9.5 / UCHL-1 in 0.2 mg/ml of h. Cerebellum (left) and IMR-32 (right) lysate(s). This experiment was performed under reducing conditions using the 12-230 kDa separation system. Western Blot: PGP9.5 / UCHL-1 Antibody [NB110-58872] - Blots of whole cell homogenate of the human SH-SY5Y neuroblastoma cell line stained with chicken antibody to glyceraldehyde 3 phosphate dehydrogenase (GAPDH, left lane, blot made with monoclonal antibody to GAPDH) and NB110-58872 (right lane). 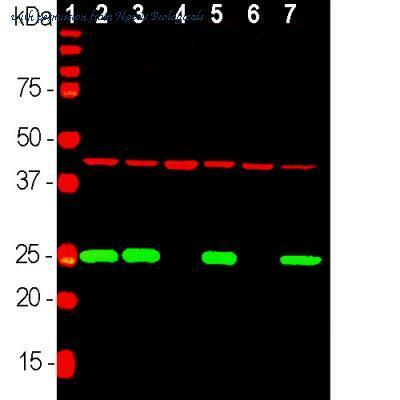 The GAPDH antibody stains a ~37kDa band while the UCHL1 antibody stains a band at about 24kDa. Immunocytochemistry/Immunofluorescence: PGP9.5 / UCHL-1 Antibody [NB110-58872] - Shows rat mixed neuron/glial cultures stained with chicken UCHL1 (green) and rabbit antibody to glial fibrillary acidic protein (GFAP-red), NB300-141. Blue is a DNA stain. Note that the UCHL1 stains neurons strongly and specifically, and that the staining is concentrated in the cell bodies, though some does extend into the dendrites also. Immunocytochemistry/Immunofluorescence: PGP9.5 / UCHL-1 Antibody (BH7) [NB110-58869] - Shows human embryonic kidney cell line 293 stained with mouse monoclonal to UCHL1 (NB110-58869) (green) and rabbit antibody to neurofilament NF-M, (NB300-133), (red). Blue is a DNA stain. Note that some of the Hek293 cells, which perhaps surprisingly have some properties of neuronal lineage cells (4), are beginning to express both UCHL1 and NF-M, both markers of neurons. The majority of cells, however express neither protein. Note that the UCHL1 is cytoplasmic and diffuse while the NF-M is concentrated in cytoplasmic filaments. Western Blot: PGP9.5 / UCHL-1 Antibody (BH7) [NB110-58869] - Blots of whole cell homogenate of bovine brain stained with NB110-58869 (right most lane) and two other monoclonal antibodies reactive with UCHL1 (left and central lane). All three antibodies show a single clean band running at about 24kDa. 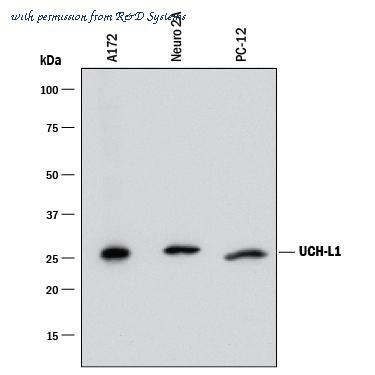 Simple Western: PGP9.5 / UCHL-1 Antibody (BH7) [NB110-58869] - Simple Western lane view shows a specific band for PGP9.5/UCHL-1 in 0.02 mg/ml of Human Brain lysate. This experiment was performed under reducing conditions using the 12-230 kDa separation system. Immunofluorescence Microscopy of Chicken anti-Ubiquitin Hydrolase antibody. 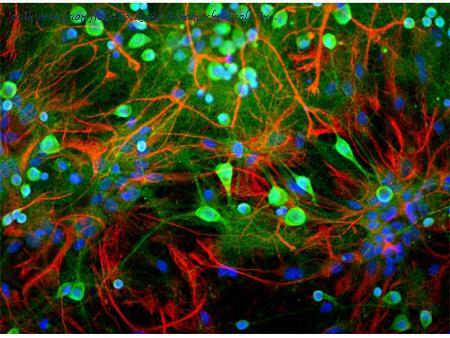 Tissue: Rat mixed neuron/glial cultures. Fixation: 0.5% PFA Antigen retrieval: not required. 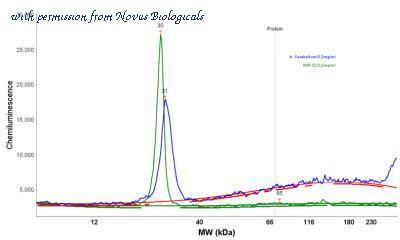 Primary antibody: Ubiquitin Hydrolase antibody at 1:500 for 1 h at RT. 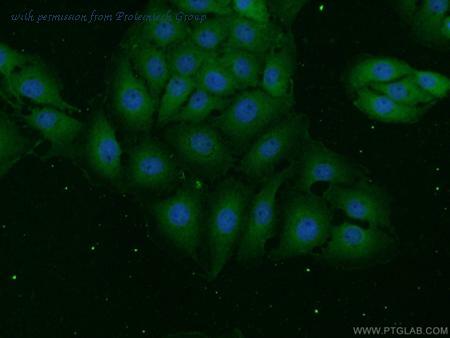 Secondary antibody: Fluorescein chicken secondary antibody at 1:10,000 for 45 min at RT. Localization: Ubiquitin Hydrolase is neuronal. Staining: Ubiquitin Hydrolase Antibody as green fluorescent signal, GFAP Antibody as red, DNA stain as blue. Detection of Human, Mouse, and Rat UCH-L1/PGP9.5 by Western Blot. Western blot shows lysates of A172 human glioblastoma cell line, Neuro-2A mouse neuroblastoma cell line, PC-12 rat adrenal pheochromocytoma cell line. 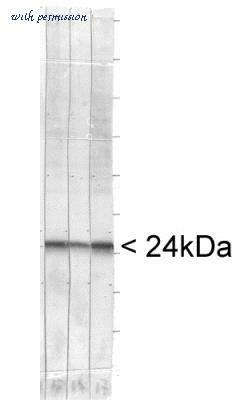 PVDF Membrane was probed with 1 ╡g/mL of Sheep Anti-Human/Mouse/ Rat UCH-L1/PGP9.5 Antigen Affinity-purified Polyclonal Antibody (Catalog # AF6007) followed by HRP-conjugated Anti-Sheep IgG Secondary Antibody (Catalog # HAF016 ). 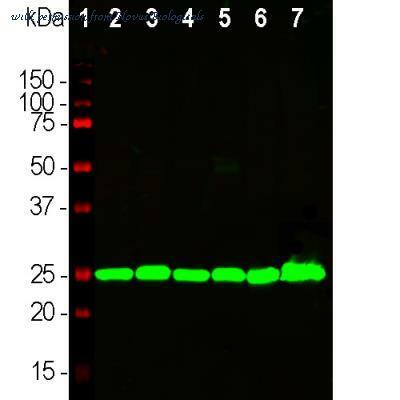 A specific band was detected for UCH-L1/PGP9.5 at approximately 29 kDa (as indicated). This experiment was conducted under reducing conditions and using Immunoblot Buffer Group 8 . Detection of Human, Mouse, and Rat UCH-L1/PGP9.5 by Western Blot. Western blot shows lysates of A172 human glioblastoma cell line, Neuro-2A mouse neuroblastoma cell line, and PC-12 rat adrenal pheochromocytoma cell line. PVDF membrane was probed with 0.1 ╡g/mL of Mouse Anti-Human UCH-L1/PGP9.5 Monoclonal Antibody (Catalog # MAB60072) followed by HRP-conjugated Anti-Mouse IgG Secondary Antibody (Catalog # HAF018 ). 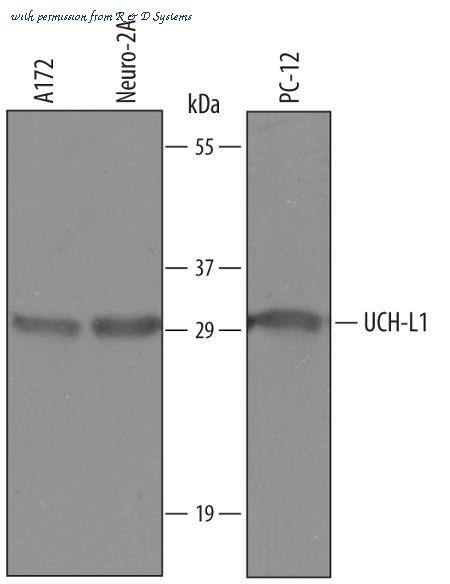 A specific band was detected for UCH-L1/PGP9.5 at approximately 26 kDa (as indicated). This experiment was conducted under reducing conditions and using Immunoblot Buffer Group 1 .